1. 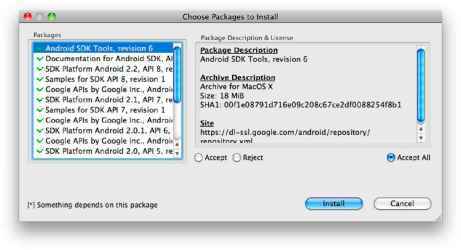 Navigate to the Android SDK download page and download the package appropriate for your platform. If you are on Windows or Linux, you will need to install Java (see http://java.sun.com/javase/downloads) first. My development machine is a MacBook Pro running Mac OS X 10.6, so in my case, the appropriate package is android-sdk_r06-mac_86.zip for Mac OS X (Intel) (Figure 7-1). 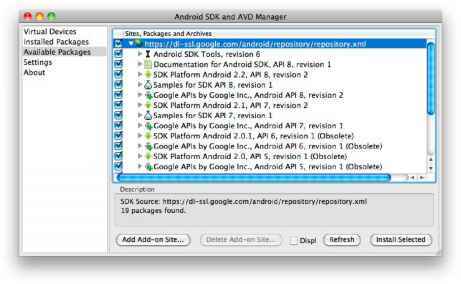 The 06 in the SDK filename refers to the version of the Android SDK and may be different at the time you read this. Welcome Developers! If you are new to the Android SDK, pie* for an overview of how to install and set up the SDK. 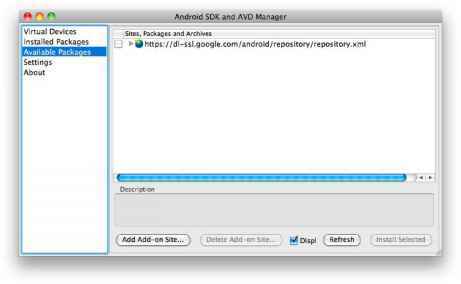 If you are already using the Android SDK and would like to update to the latest tools or platforms, please use the Android SDK and A VD Manager to get the components, rather than downloading a new SDK package. The steps below provide an overview of how to get started with the Android SDK. For detailed instructions, start with the Installing the SDK guide. Java comes preinstalled on Mac OS X and is available in most Linux package managers. If you install it on Windows, you'll need to set your JAVA_HOME environment variable. Follow the instructions in "Setting Up the Environment" on page 115, but instead of modifying the PATH environment variable, create a new environment variable called JAVA_HOME and set it to the directory that Java was installed in (such as C:\Program Files\]ava\jdk1.6.0_21). 2. Unzip the downloaded archive to whichever directory you like. I'm going to put mine on the desktop. On Windows, you won't be able to use the ~ shortcut for your home directory. Also, you should avoid spaces in the path names, so if you are using Windows XP (which puts at least two spaces in your home directory due to home directories residing in Documents and Settings), you should create a directory such as C:\Source instead of putting things on your desktop. 3. For simplicity's sake, I'm going to rename the unzipped SDK directory to Android. 6. When the Android SDK and AVD Manager window opens, click Available Packages in the left sidebar. You should see a single item appear in the Sites, Packages, and Archives panel (Figure 7-2). 7. Check the box next to https://dl-ssl.google.com/android/repository/repository.html to install all of the available packages and archives (Figure 7-3). 8. Click the Install Selected button in the lower right corner of the window. 9. A window will appear asking you to accept the license terms. Read the terms, check the box next to Accept, and click the Install button to begin your download (Figure 7-4). 10. When your download completes, click Close to close the download window. 11. On Mac OS X, select Quit Android from the Android menu to leave the Android app. On Windows or Linux, simply close the window.